Experience the warmth of our renowned hospitality in the romantic setting of the High Victorian Era. 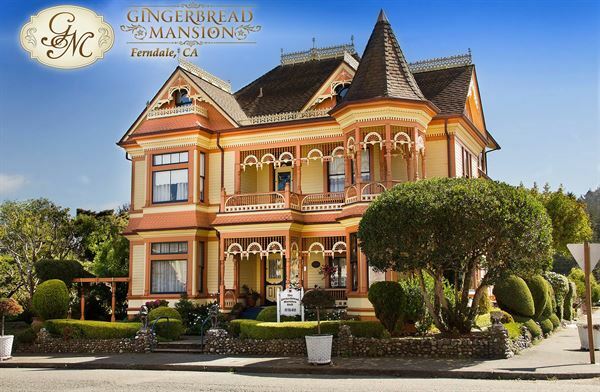 A four diamond Inn, the Gingerbread Mansion is nestled in the heart of the historic town of Ferndale, between breathtaking Northern California Redwoods & the Lost Coast Beaches. Here, travelers are enveloped in a unique mix of nature’s charm, and luxurious accommodations. The Gingerbread Mansion Inn is the perfect venue for weddings ceremonies and receptions. Whether you say your vows in the English Garden or in one of our parlors—no setting could be more elegant or charming. We will handle your catering needs and assist you with all the details that make your day special.